The randomised controlled trial involved 278 adults in Oxfordshire who were substantially overweight and interested in losing weight. Participants were either offered a referral to a low energy total diet replacement programme for 24 weeks or were enrolled into their GP practice's weight management programme, including advice and support to lose weight from a practice nurse. Participants on the total diet replacement programme were asked to reduce their intake to 810 calories a day by replacing all food with specially formulated soups, shakes and bars in addition to milk, water and fibre supplements. 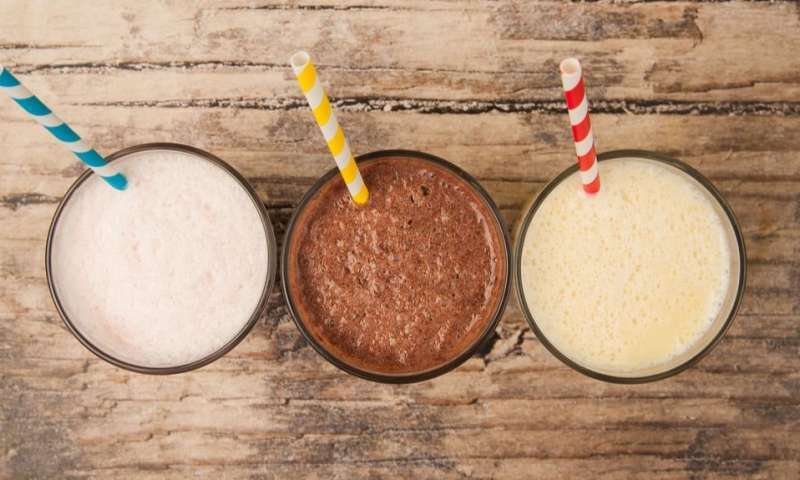 These diet replacement products, which are designed to be nutritionally complete, were offered for eight weeks, followed by a gradual re-introduction of conventional food over a further four weeks. Participants were invited to attend regular meetings with a trained counsellor to develop techniques to help them follow the diet and later maintain their weight loss. From 12-24 weeks they were encouraged to continue to use one product a day to replace a usual meal. After 12 months, these participants had lost on average 10.7kg (1 stone, 9lb) which was 7.2kg (1 stone, 1 lb) more than those enrolled into the GP practice programme. They also showed greater reductions in their risk of developing heart disease, stroke and diabetes. 45% of participants on the low energy programme had achieved a weight loss of 10% or more compared with just 15% in the GP practice programme. The study's chief investigator Professor Susan Jebb, Professor of Diet and Population Health in Oxford University's Nuffield Department of Primary Care Health Sciences, said: "In the past we have worried that a short period of rapid weight loss may lead to rapid weight regain, but this study shows that nine months after the intensive weight-loss phase, people have lost more than three times as much weight as people following a conventional weight-loss programme." Co-investigator Professor Paul Aveyard, a GP and Professor of Behavioural Medicine at the University of Oxford said: "Losing weight and keeping it off is hard and we know that people welcome support from their GP. This study shows that GP referral to a total diet replacement programme in the community is an effective intervention which GPs can confidently recommend, knowing that it leads to sustainable weight loss and lowers the risk of heart disease and diabetes. This model of care can be safely offered by GPs in routine primary care." Dr. Robin Fox, a GP from the Bicester Health Centre who took part in the study, said: "Taking part in the DROPLET study has changed my practice. I saw for myself the results in my patients who enrolled and were assigned to the TDR programme. I'm now happy to advise my patients who would benefit from losing weight that they should consider TDR weight loss programmes as an option." Co-investigator Dr. Nerys Astbury, Senior Researcher in Diet and Obesity at the University of Oxford's Nuffield Department of Primary Care Health Sciences, added: "This model of care, where patients are referred to a provider in the community for support, offers the potential for rapid roll-out at scale across the NHS and could help reduce the pressure on GPs in treating obesity-related disease." Total diet replacement programmes are suitable for most people who are obese and wanting to lose weight. Those who suffer from certain medical conditions, or who are taking particular medications, may not be suitable and are advised to consult their GP before starting a programme. The study found no evidence that the total diet replacement programme increased the risk of adverse events which interfered with normal daily life. The full paper, "Doctor Referral of Overweight People to Low Energy total diet replacement Treatment (DROPLET): pragmatic randomised controlled trial," can be read in the BMJ.